If you have lot of images on computer, sorting and organizing them can be a big task. Do you want to automatically sort images based on image size, resolution dimensions and aspect ratio? Doing it manually can take lot of effort and time. However, you can automate this process by batch sorting images based on size using free portable software ‘Dimensions 2 Folders’. 1. Download Dimensions 2 Folders utility program on computer. 2. Double click to extract files and then launch utility for use. 3. Select the source folder containing images of different resolution and sizes. 4. 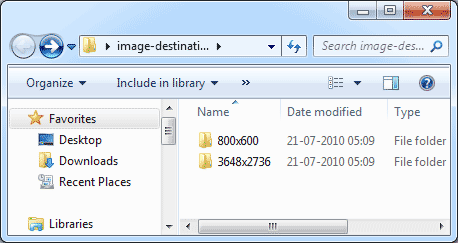 Also select destination folder where sorted images should be saved in separate folders. 5. Click GO button to automatically sort images based on image sizes or other configured filters. Utility will create seperate folders based on available image resolution sizes and properly arrange images in respective folders. 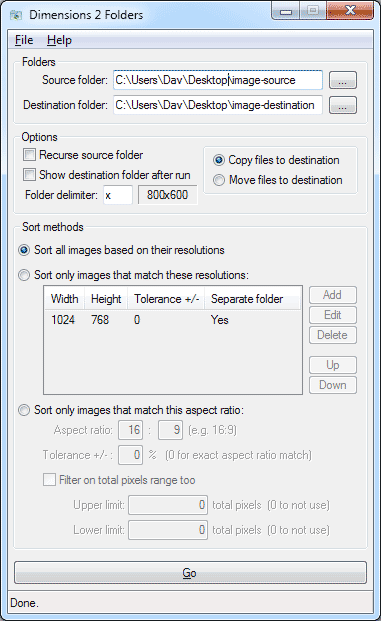 Besides default sorting option, there are number of options for customized image sorting based on specific resolution, aspect ratio and total pixel range filters.